Positive Detroit: Detroit Synergy & Inside Detroit Are Teaming Up For the 8th Annual Shop Detroit Holiday Shopping Event This Sat! Detroit Synergy & Inside Detroit Are Teaming Up For the 8th Annual Shop Detroit Holiday Shopping Event This Sat! Join Us for our 8th annual pre-Holiday shopping event taking place Saturday, November 26th! in Detroit. 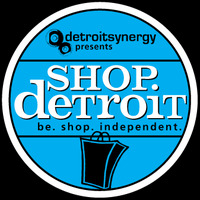 Shop Detroit is an event that encourages shoppers to purchase products, services and gifts at Detroit retail locations. Detroit Synergy member-volunteers created Shop Detroit eight years ago specifically to promote the often-overlooked retail attractions available to shoppers in Downtown Detroit and surrounding neighborhoods. This event is designed to appeal to shoppers from all over the Metro Detroit area. The project also strives to educate the growing numbers of downtown retailers in how important it is to have a coherent merchant community. This year, Detroit Synergy is partnering with Small Business Saturday. Small Business Saturday, which falls between Black Friday and Cyber Monday, is a national movement to drive consumers to shop at local merchants during the heaviest shopping weekend of the year. American Express, the founding sponsor of Small Business Saturday, created the movement in response to small business owners’ most pressing need: more demand for their products and services. Small Business Saturday started in 2010 in response to small business owners most pressing need: more demand for their products and services. There will be giveaways and a lot of fun in the city! Support local and shop small! You can pre-register to let us know you are joining us here, Shop Detroit pre-registration. Day of registration will take place at the Inside Detroit Welcome Center from 9:30am - 4pm. Shoppers will receive a full list of retailers, specials and other products that will make this shopping experience a happy one. DSG is gearing up for the 2011 Shop Detroit. Shop Detroit gives you the experience of shopping in the city while at the same time supporting city merchants. If you are interested in volunteering in the development of the 2011 Shop Detroit, please email community@detroitsynergy.org OR dsgsteering@detroitsynergy.org.